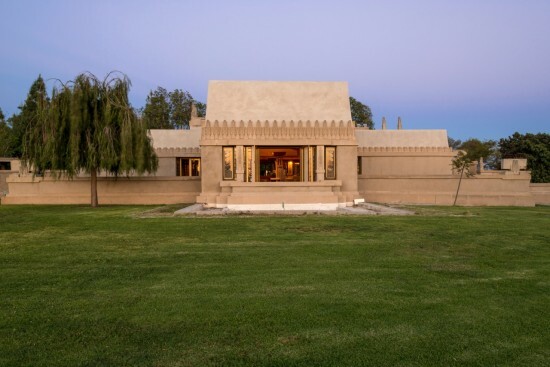 The lengthy renovation of Frank Lloyd Wright's Hollyhock House—his first residence in Los Angeles—is finally over. On February 13 Mayor Eric Garcetti and other local luminaries will cut the ribbon on the landmark's re-opening. Built between 1919 and 1921, the house takes its name from the favorite flower of Wright's client, feisty oil heiress Aline Barnsdall. 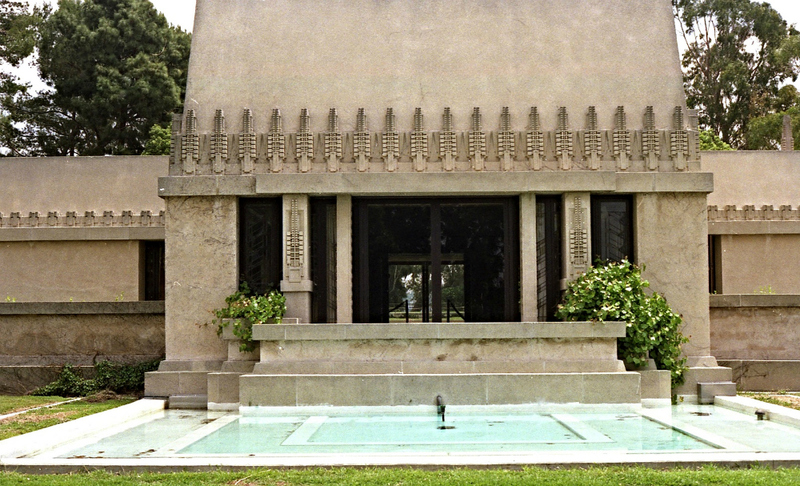 Its eclectic style combines elements of Mayan Revival, Early Modernism, and Wright's own Prairie Style, featuring tilted concrete walls, narrow, leaded art glass windows, bas-reliefs, and an expansive central courtyard. The centerpiece is the living room, with its theatrical fireplace, which was once fronted by a large, water-filled moat. The Hollyhock motif is repeated in details throughout. The house had already undergone renovations in 1944, 1974, and (due to earthquake damage) 2001. But over time the property had further deteriorated, and the $4.35 million renovation was begun in 2011, led by curator Jeffrey Herr, non-profit Project Restore, Griswold Conservation Associates, and the city's departments of Engineering and Cultural Affairs, among others. The bulk of funding for the restoration came from the California Cultural and Historical Endowment, the National Park Service's Save America's Treasures program, and the City of Los Angeles. "We were able to dig deeper into this than has ever been done before," said Herr, who noted the team brought the house as close as possible to its original form through "archaeological" explorations, investigating everything from paint and plaster layers to original drawings and blueprints. For instance, to bring plaster finishes from their "muddy" form back to their original glistening gold state, the team devised a formula of micah suspended in alcohol. "When you walk in, it’s pretty amazing the difference. I still haven’t gotten used to it, which is a good thing," said Herr. Among other things, the team restored many of the home's moldings, walls, floors, fixtures, doors, and fenestration. Heavy lifting included waterproofing the house, fixing drainage systems, restoring the roof, and performing crack repairs. The most rigorously restored rooms were the dining room, library, enclosed porch, garage, kitchen, and chauffeur's quarters. After the February 13 opening the house will be open for tours through the evening, into the next day—which happens to be Valentines Day for you romantic architecture geeks. Some trivia: Wright and Barnsdall originally planned an extensive, very unconventional complex for the site of Barnsdall park, including a movie house, school, artist housing and studios, and what one newspaper called "one of the most exquisite theaters the world has ever seen." Wright's distraction, and Barnsdall's unhappiness with the client and the plan, doomed the scheme.